This is an extremely appealing c.1924 tourist pocket map or plan of Paris, France, by the Librarie Hachette. Centered on the Seine River, it covers embastilled Paris as contained in the Thiers Wall, and its immediate vicinity, including the Bois de Boulogne and part of the Bois de Vincennes. It reflects the transformation and modernization of Paris under Napoleon III and Georges-Eugene Haussmann. 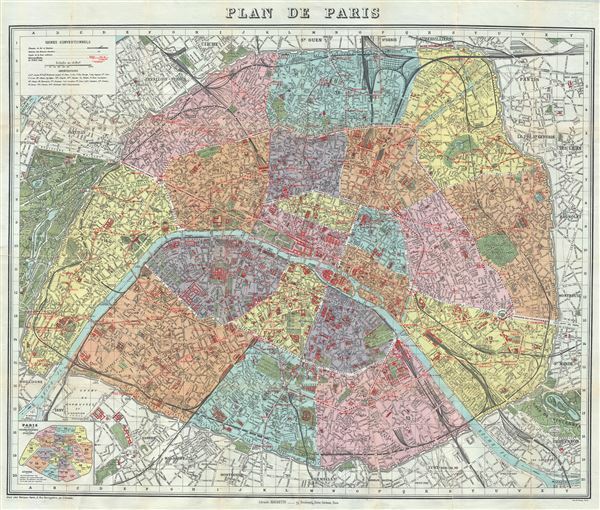 Known in French as theÃ‚Â 'Grands Travaux,' Haussmann's redesign of Paris defined it as a modern city, with narrow alleyways and confusing streets replaced by a broad network of grand boulevards, imposing facades, parks, and monuments. Paris proper is colored in appealing pastels and is divided according to 20 Arrondisments. Shows exceptionally remarkable attention to detail in the public gardens where subtle expressions of landscape design are apparent. The map also notes individual streets, monuments, churches, town halls, railways, gardens, bridges and palaces. Identifies countless important buildings and monuments, including the Eiffel Tower, the Louvre, the Hotel des Invalides, the Jardin des Tuileries and many other Parisian landmarks. Although undated, the state of development of the Paris Metro, particularly the extension of the Metro Line 7, suggests that this map must have been printed around 1924 Ã‚Â– 1925, before the extension of the 7 from Ã‚Â Palais Royal to Pont Marie. The map is accompanied by a 45 page booklet which includes a street index and a visitor's guide to the public buildings, theaters, museums and places of amusements, as well as a complete street index. An altogether marvelous decorative map. Published by the Librarie Hachette, 79, Boulevard Saint-Germain, Paris. Very good. Minor wear and verso repair along original fold lines. Accompanied by original cardboard binder (back cover missing) and a 45 page booklet.